Rights, Broadcasters et Al beyond the UK. Probably just to piss off the BeOutQ viewers. I can't see the Premier League being too happy though - you'd think that would be a breach of their rights agreement. Sometimes they do have strange things happening though, one of their English channels was showinga Chelsea pre-season match last summer which finished a draw and went straight to penalties. Whoever was running the channel obviously wasn't aware of this and the coverage finished with a pre-recorded programme starting. Luckily it was on one of their other channels in French but as there was no caption about it I assume it was a mistake or automated system. 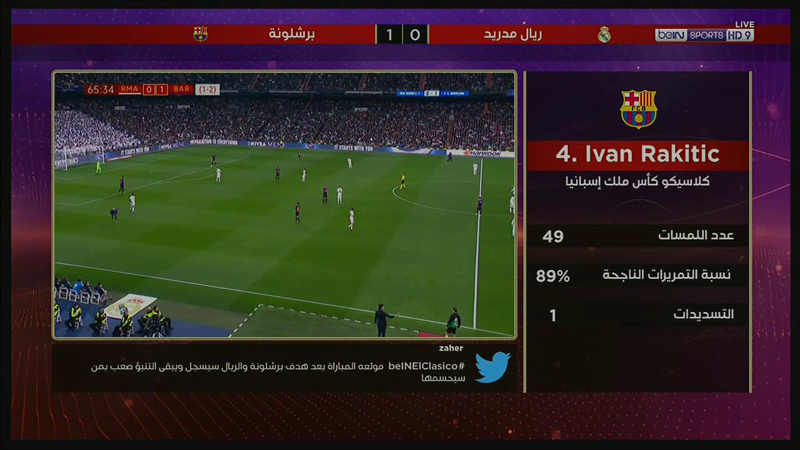 BeIN USA have been showing a rather cleaner viewing experience, but they do have a graphic next to the channel bug reading 'El Clásico in 3 days'. Does it only count as one if it's in the league? Certainly Eleven Sports were counting it as one tonight, but it’s probably the last exclusive thing they had going for them, Saturday’s La Liga encounter will be on Premier Sports/eir Sport. I’ve heard the label applied to any meeting between the two sides, be it La Liga, Copa del Rey, Super Cup, or Champions League. TVP in Poland has aquired a sub-license from Eleven Sports to broadcast each race this season ... from the 45th minute of the race. Interesting, I wonder if Sky would ever consider something like this for a FTA broadcaster in the UK. I believe the current sub-license deal with Channel 4 is just for one year at the moment. That, in some of the longer races is very generous. Monaco, Belgium, America, Britain - all fairly long races in the calendar where TVP will effectively show the last half the race live. I doubt Sky would allow Channel 4 to come in at the same point and that's even if the deal with FOM even allows any sort of FTA sub-licence deal. If there was, I could see a 'as soon as the race leader passes the line and there's 10 laps remaining, you can show the rest of the race live' kind of deal - but it's the deal Sky thrashed out with Bernie, so very doubtful. FOM can't even offer their own over the top F1 TV channel in the UK - so I don't hold out a slow relaxing grip on the UK tv rights very soon. That's deliberate (and very clever) though. Going FTA totally reduces BeoutQ's little piracy rebroadcasting game to nothing. Why as a viewer would you go to the bother of buying a BeoutQ reciever, when you can get it down the ariel for free? Other sports may take a short term hit on the rights and follow suit. Ok Question for the international sports experts out there. Right now, it's 'Spring Training' (pre-season friendlies) season for the MLB (Major League Baseball) which takes place in Texas and Florida. Watching one of the games this morning on BTS/ESPN, set me thinking. Given there are a multiple teams, and each team has their own 'aligned' tv station/network showing away game coverage, each have their usual home graphics/score box (i.e NESN branded graphics for Boston Red Sox, Fox Sports Brewers graphics for Milwaukee ect ). With the amount of teams playing games, its obviously not cost effective to drive several different OB Scanners, and graphics units down south, and rig up for each game. So how is this done? Is it the case that a locally based OB provider, supply a 'clean' feed of the game from whichever stadium, that signal (with comms) are then sent back to where each teams channel is based, where the graphics are added in locally? Or would the graphics be provided via a score datastream, and then the house style channel skin is added on site? And bonus question - as MLB administer the international rights, here in the UK, everything we see is sent from the stadium, then to the teams own channel, then to MLB master control in New York, then by fibre to BT Sport at Here East. Or, a route slightly more direct?